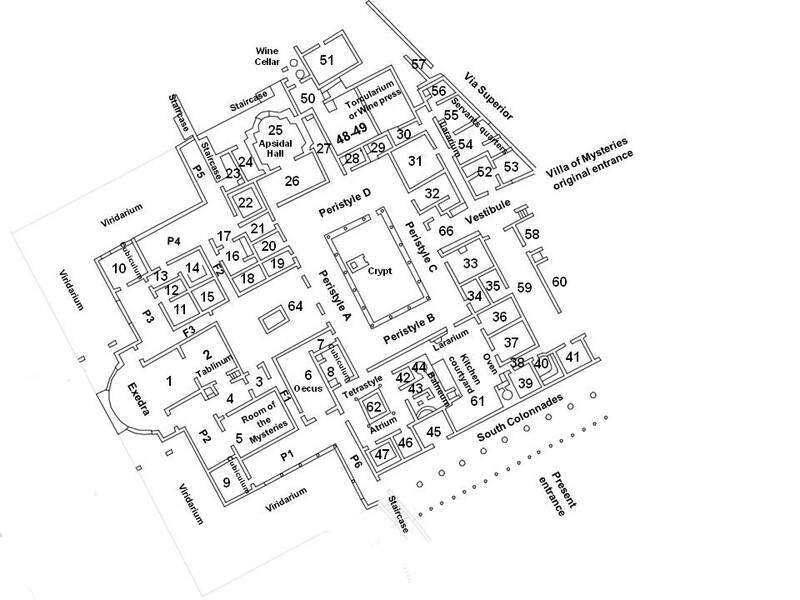 Pompeiiinpictures plan of the Villa of Mysteries or Villa dei Misteri. Each room is on a specific page on our site with information and photographs. If your screen is large enough (more than 960px wide) press the room you want on the plan to see the pictures. Pompeii by Amedeo Maiuri, 15th Ed., Istituto Poligrafico dell Stato, Roma, 1978, p. 97-101 and fig. 17. The Villa of Mysteries in Pompeii, Edizione Spano, 2008. These are both basically guidebooks, but are based on a number of other works, the principal one being La Villa dei Misteri by Amedeo Maiuri, Roma, 1931. The room numbers and descriptions are those referred to on the pompeiiinpictures pages for Villa dei Misteri. This plan is to help you accurately locate the rooms shown in the photographs of this villa. Please be aware that the room numbers shown may differ from any other plans or records both published and unpublished.